Author: Jeffrey Heath. Series edited by: Herrmann Jungraithmayr, Norbert Cyffer. 16 pp. Roman, 402 pp. 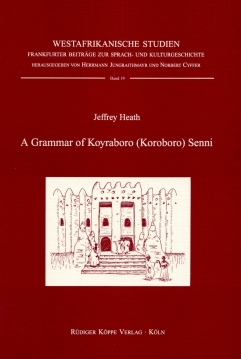 This grammar accompanies the author’s book Texts in Koroboro Senni (Songhay of Gao, Mali), see link at the bottom. Koyraboro (often contracted to Koroboro) Senni is spoken in Gao, Mali. It belongs to the Songhay languages, which have tentatively been related to the Nilo-Saharan language familiy. The expression koyra-boro senn-i literally denotes “the language of the town dwellers” as opposed to nomads (like the Tuareg) and other mobile people (like the cattle-herding Fulani and the Bozo fishing-people). Although koyra-boro senn-i is associated with settled towns, it is a cosmopolitan language which has spread east and west of Gao, to the Fulani living at the Mali-Niger border and to the Bozo. Furthermore, three appendices give an account of the riverine Koyraboro Senni dialects east and west of Gao and of the Fulan Kirya dialect of the Gourma, a group of villages to the south of Gao where Songhay-speaking Fulani live.